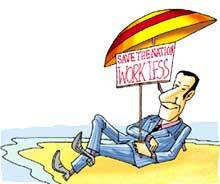 The Philippines government has come up with a novel energy conservation strategy: 'Work less'. On March 22, 2005, president Gloria Macapagal Arroyo's cabinet approved a plan to reduce the workweek for civil servants to four days in April and May to save at least 10 per cent of its fuel and electricity bills during the summer: time of peak electricity demand. The country is already facing the heat of a record oil price hike; it imports nearly all the oil it needs (330, 000 barrels daily). "The current high prices in the world market make it imperative that we conserve energy and the government has to head the way in this effort," said Raphael Lotilla, energy secretary. The plan might exclude crucial services like the police and hospitals. It will also slightly increase work hours. The government had also introduced many such schemes in 2004.